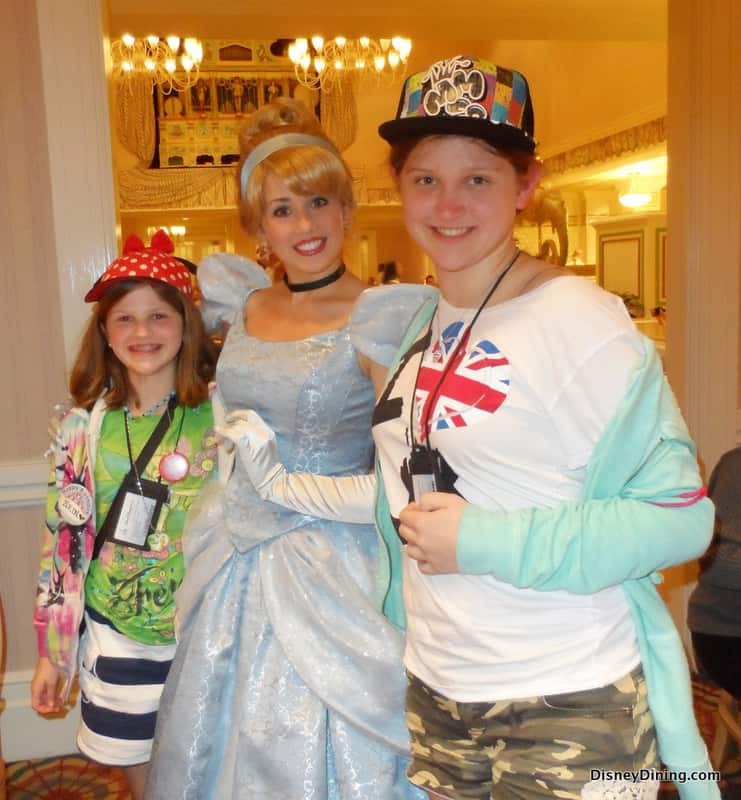 When I made my family’s reservations for Cinderella’s Happily Ever After Dinner at 1900 Park Fare for our most recent trip to Walt Disney World, I was a little leary. We have a list of favorite restaurants we visit whenever we go on vacation and rarely stray from our course. My oldest daughter, age 15, is a picky eater and my other daughter, age 11, inherited some of her mom’s food allergies. So, we usually stick to what we know and have always been happy with our choices. 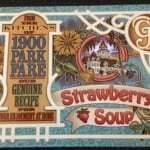 This vacation, though, I was determined to branch out and try something new and scheduled our 1900 Park Fare meal as the last one of our trip. Admittedly a risky move since our vacation could have ended on a bit of a sour note. 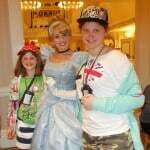 Cinderella’s Happily Ever After Dinner at 1900 Park Fare had many surprises in store for this family. The first came when our name was called and we were lead to an adorable wall mural for a family photo. As is fitting for a Cinderella-themed dinner, the backdrop created a lovely fairy tale scene with the castle in the distance among trees, hills and a path with Cinderella’s coach making its way there . Our reservations were for later in the evening and after a long day of touring, we didn’t exactly feel like we were looking our best, but none of us seemed to care too much and we posed for our final family picture of the trip. 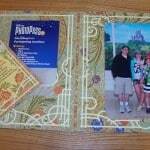 The picture is part of a photo package you can purchase during dinner that typically includes a 5×7 and a few smaller photos. 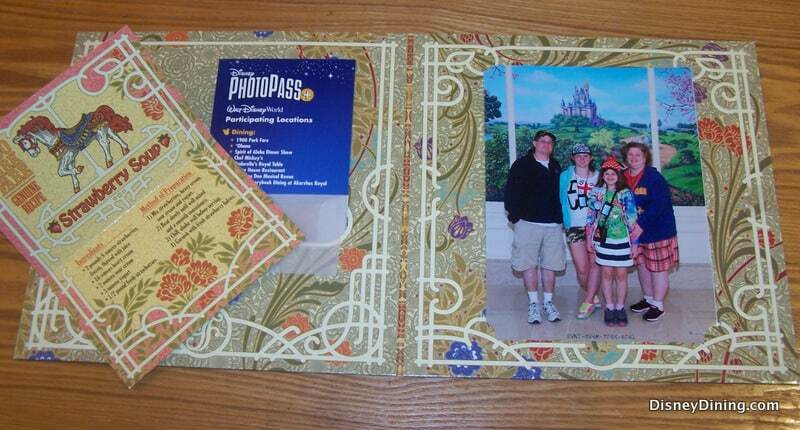 We had the PhotoPass Plus, so I thought we’d get the picture on our PhotoPass and be all set. 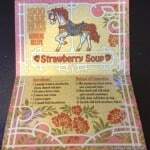 It turned out we received the photo package for free, which came in a decorative folder and had the recipe for their famous Strawberry Soup! All buffets are not created equal, though. 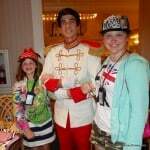 Yes, the girls took a few items from the kid-friendly section of the buffet. For the first time, though, both of my daughters ventured into some new food territory. I was surprised at the wide range of options available. 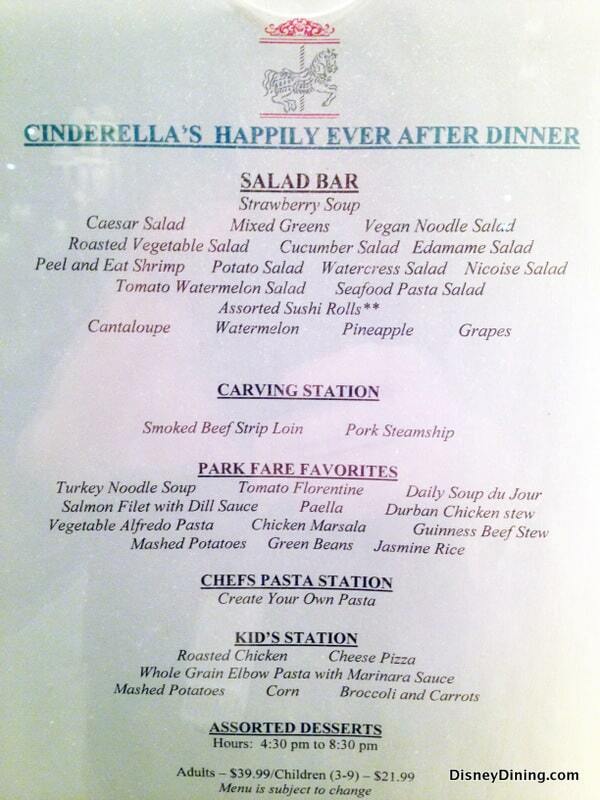 There is the standard fare you’d find at a WDW buffet: carved beef and pork, pasta and salads. Beyond the traditional offerings, the buffet included a nice cultural representation including Asian (sushi, edamame salad and noodle salad), Europe (chicken marsala and Guiness beef stew) and more. The food was always hot, fresh and replenished often, despite the fact that we were among the last parties to be seated for the evening. And, yes, the desserts were yummy, too. 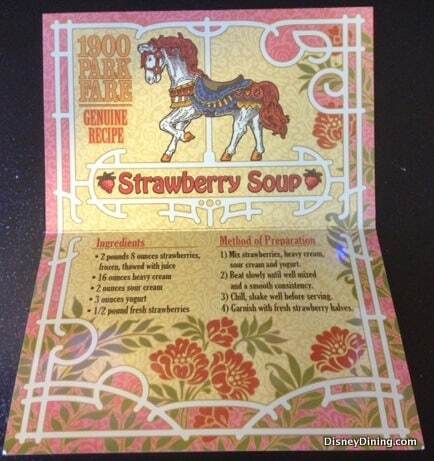 All of us tried the strawberry soup, which was hard for my girls’ to understand how something so cold could be considered a soup. As a strawberry lover, I found it creamy, refreshing and wishing I could get a cup (or more) to go. I need to dig out that recipe card and try to make it soon! 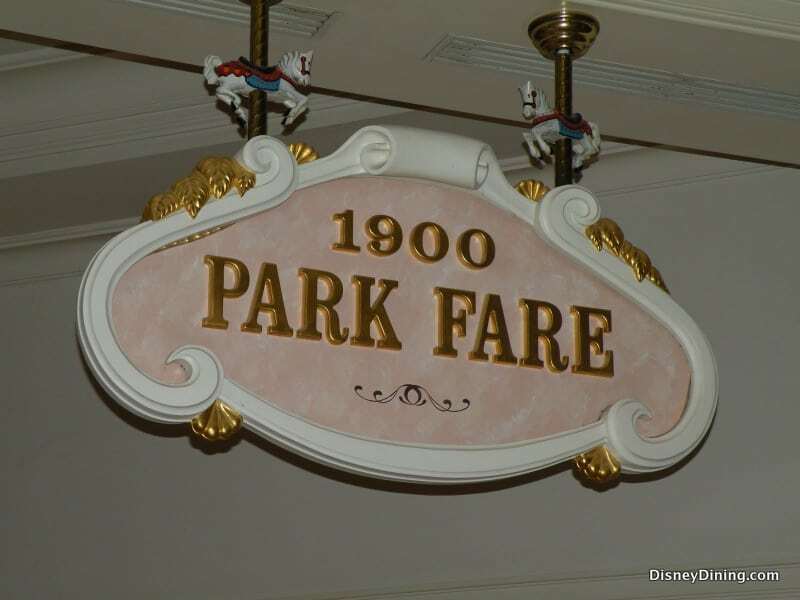 1900 Park Fare is a character dining option and we were pleasantly surprised at how much fun we had during our meal. 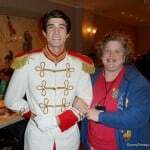 Cinderella and Prince Charming were lovely and the Prince went out of his way to make the ladies of the family (including yours truly) feel like a princess. 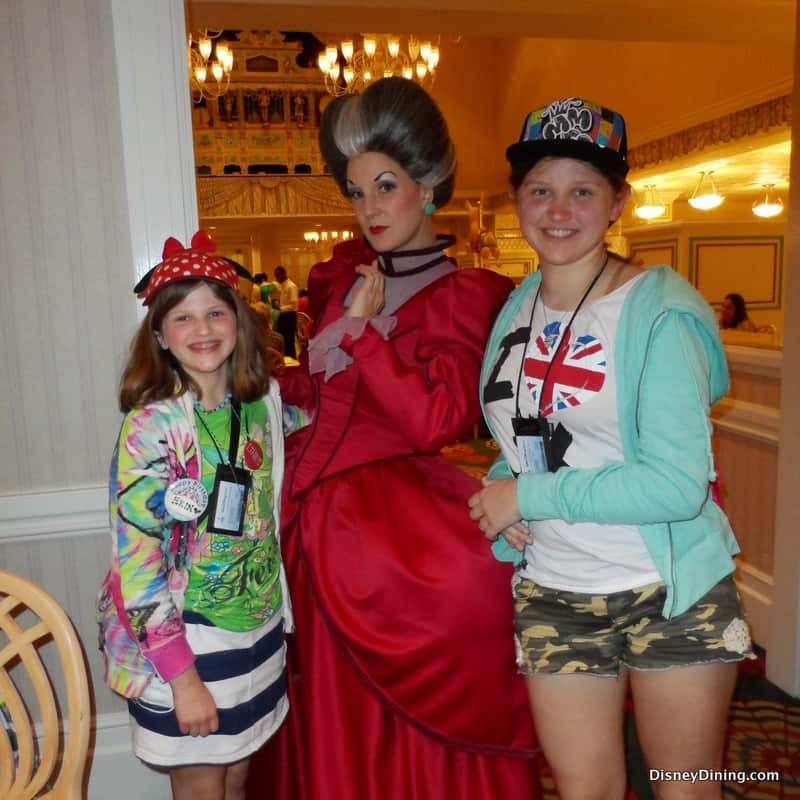 The best part of the meal was meeting Lady Tremaine and the wicked stepsisters Druzilla and Anastasia. 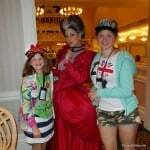 Whether it was Anastasia saying how nasty her sister is and how much she wanted a prince of her own, to Lady Tremaine raising an eyebrow at our daughters’ manners–they said please and thank you while she was there and Lady Tremaine wondered what they wanted–we got a lot of laughs, some great pictures and memories that will last forever. 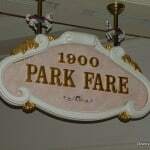 1900 Park Fare proved that you don’t have to be a little kid to enjoy character dining experiences. Needless to say, our latest Walt Disney World vacation ended on quite the high note and taught my family a valuable lesson: don’t be afraid to try new things and new places. You might just find the newest addition to your family’s must-do dining list! Food: The food pleased everyone from the pickiest eater in our family to my husband, who is willing to try almost anything. We had the last seating of the evening and the staff kept the food stations filled for everyone to have multiple helpings and still keep it either piping hot (meats and pastas) or crispy cold (fruits, veggies and salads). Our favorites of the night were the carved beef and pork, chicken marsala, salads, strawberry soup and the dessert buffet. Atmosphere: 1900 Park Fare may be considered casual dining, but when we walked into the dining room, we were taken with how lovely it is inside. I believe my oldest daughter called it elegant, but not stuffy. There were a lot of nice details to look around the room during our meal, but our favorite was the carousel horses! The character interactions also made the atmosphere feel special. 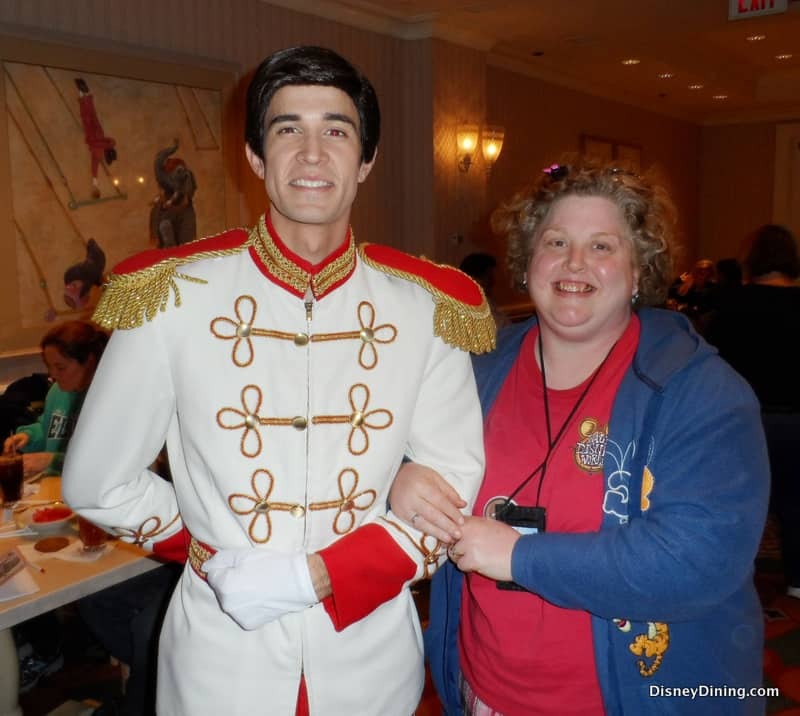 It was so nice to not only meet the characters, but also actually have conversations with them and see them truly enjoy themselves with the guests. 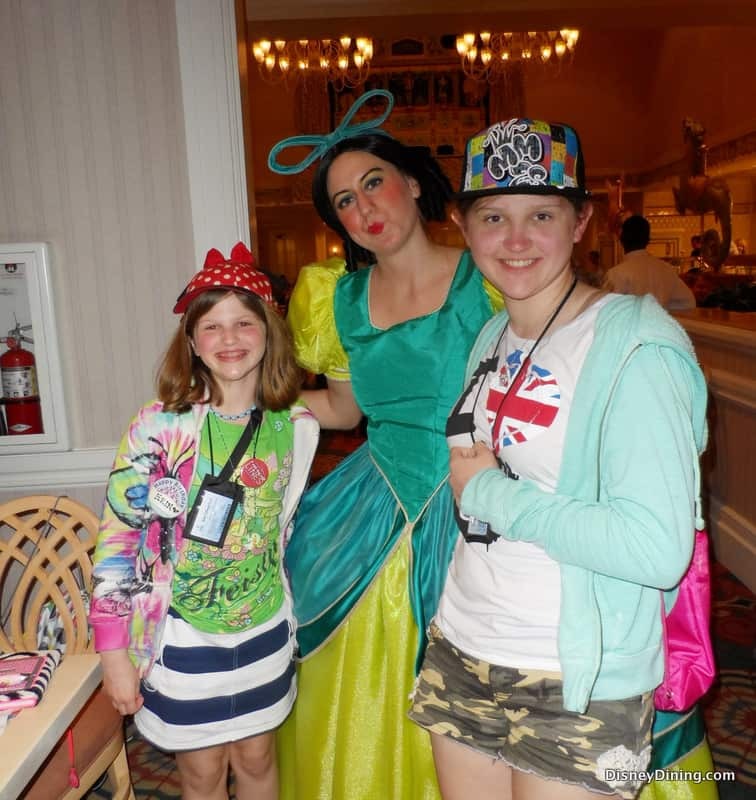 When a family walks out of a character dining meal saying “that was worth the money”, I consider that a win. 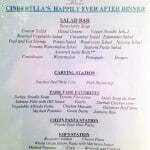 Service: It is a buffet meal, but every seating area has its own servers. Our glasses were always refilled quickly, our dishes removed when we were finished, but not before. I cannot stand being rushed and I thought since our reservation was late, we’d be pushed out the door. That was not the case. Our server also made sure to remind us that we needed to be at our seats once we saw the characters heading to our section, because once they passed through, it would likely be the last of the evening. 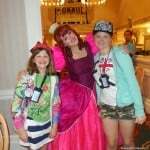 She checked back in with us a few times and even gave us a heads up when the cast would be coming our way. 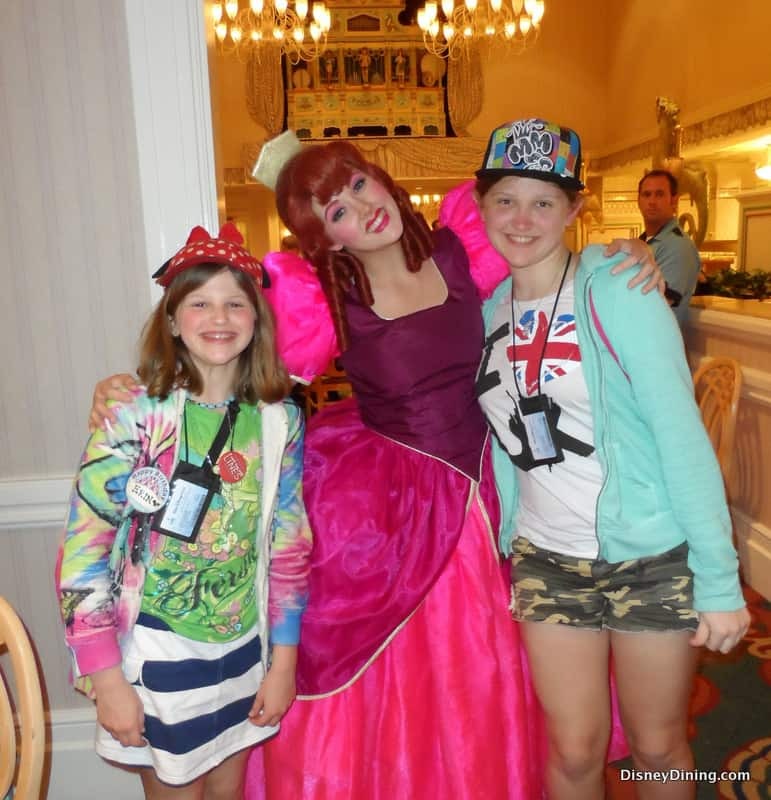 Tips: As with any character dining experience, book as early as you can. We were fortunate that we got the reservation because we only had a month to plan our trip this time and we got the last slot of the evening. 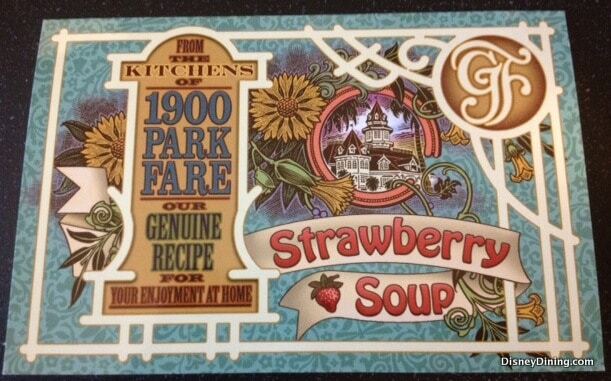 1900 Park Fare is a great place to try new things because if you don’t like something, you can easily find something else that suits your fancy. If there are allergy concerns, either make a note in your reservation or tell your server when you are seated. As with any Disney restaurant, we were given a personal tour of the buffet by one of the chefs to let us know what was “safe” for us to eat based on our allergies. Listen to your server about being ready for the character interactions; he or she is not trying to rush you. 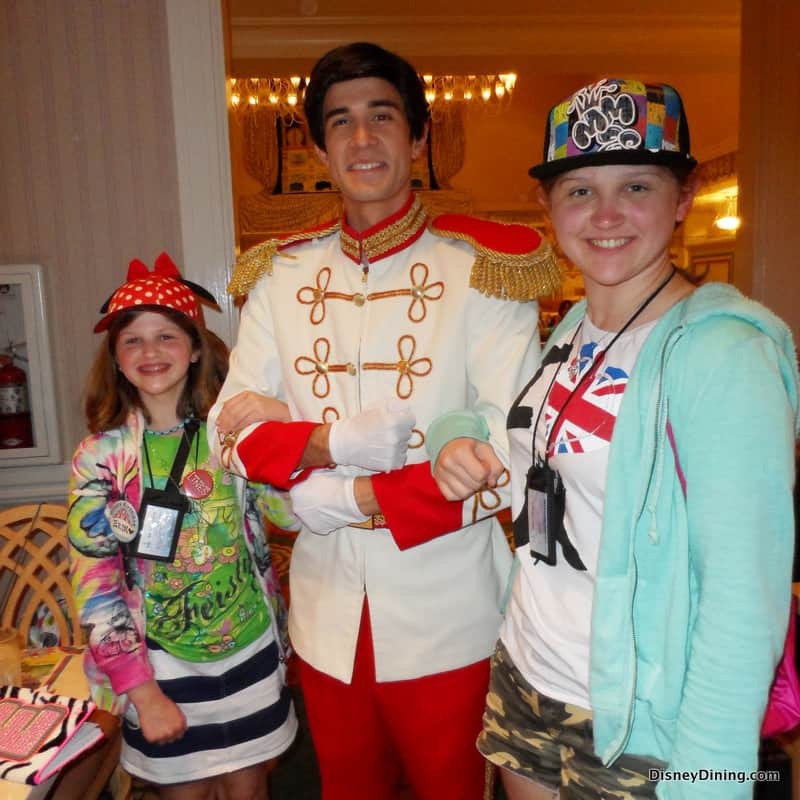 The servers don’t want to see disappointed kids and angry parents because the family missed seeing the characters. 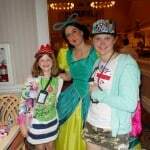 Lastly, characters are never guaranteed, so don’t be too disappointed if someone you’re expecting is not there during your visit.